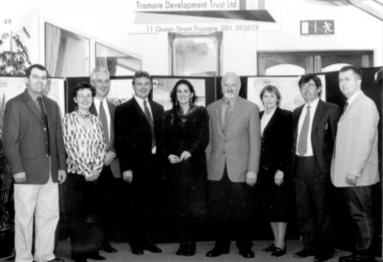 The genesis of Tramore Development Trust was a group, named ArcArt. This group was made up of two Architects and one Artist who believed that the centre of Tramore town needed to be energised and revitalised. As a result in 1999, they carried out a feasibility study of Tramore. Over a 3 month period, they prepared a series of photographs and drawings, which outlined design ideas to help revitalise the centre of Tramore town. In order to present these design ideas to the people of Tramore, a public meeting was held on 23rd June 1999 in the Protestant Hall on Church Rd, Tramore. There was such a positive reaction and response to the design proposals from the community of Tramore that it was decided to harness the generated energy and form a group of interested people. Tramore Development Trust was thus formed. A Limited Company by guarantee formed in 2000. 9 Directors – with experience in Architecture, Engineering, Finance, Law, Business, Community Development, Public Relations. Consists of 17 Partnerships, which include: AIB and Garda Siochana. Original Founding Committee – Directors; Anne Harpur, Chairperson, Sandra Thompson, Secretary, John Smiles, Treasurer, Paul Jackman, Eamonn Mc Sweeney, Brian Nolan, Bridget Power, David Smyth, Joseph Stokes. The group set about establishing its objectives and mission. It availed of the services of Alan Caldwell of the Corrom Trust, Scotland. Together with Alan the group formed the first community development trust in Ireland and became a charitable company limited by guarantee. It held several public consultations with the community and as a result of community feedback devised the first community led community plan in Ireland which created the road map for all the future projects undertaken by TDT.